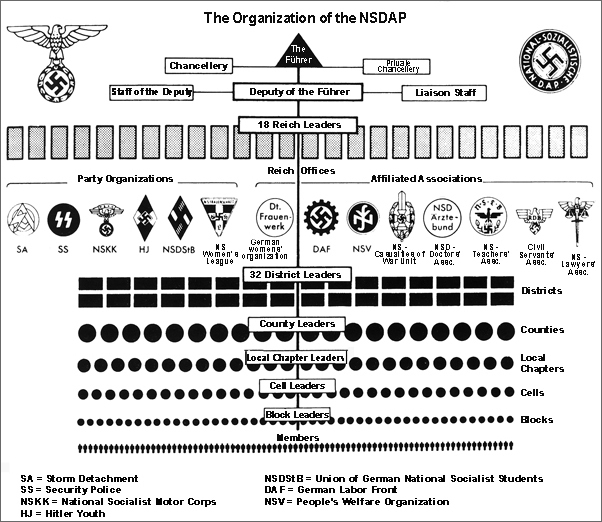 In accordance with the authoritarian "Führer principle," Hitler had built up the NSDAP in the shape of a pyramid. Power flowed exclusively from top to bottom. Hitler himself stood at the pinnacle of the hierarchy and had unlimited power of command. All other party offices had comprehensive "Führer power" over the authorities subordinate to them. Thus competence and responsibility were supposed to be guaranteed on every level and in every area. After the "Law against the Formation of New Political Parties" was decreed on July 14, 1933, the NSDAP was the only party allowed in Germany. Henceforth, it played a double role as both a mass organization and an elite institution. On the one hand, it tried to integrate the general population into the National Socialist movement; on the other, it also considered itself responsible for the education of the Nazi leadership elite.